Far-fetched, unsupported claims about goji berries include that they are helpful in treating mercury poisoning, cancer, fatigue and AIDS, reports Rebecca Rosenberg, writing for the Columbia University News Service. These claims aside, the nutritional value of this food is undeniable as it is high in both micro and macronutrients. 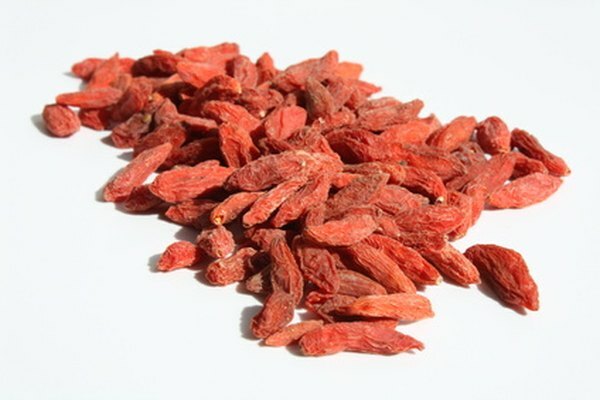 Although the English name is "wolfberry," the name "goji" is a loose transliteration of its Chinese name. One serving of dried goji berries weighs 28 grams and is equivalent to 1/4 cup of dried berries. Slightly less than 1 ounce, this is roughly the same as a large handful of berries. You can eat goji berries as a snack or add them to yogurt or cereal. One serving of dried goji berries has 104 calories. This means that an occasional handful of goji berries will not undermine your efforts to maintain a healthy weight. Moreover, with only a 1 gram of fat, no cholesterol and no saturated fat, goji berries are a heart-healthy alternative to other high-fat snacks. The American Heart Association urges everyone to limit their consumption of cholesterol and saturated fats because these are associated with heart disease. One serving of dried goji berries has 180 percent of the daily value for vitamin A, 30 percent of the DV for vitamin C, 9 percent of the DV for calcium and 15 percent of the DV for iron for people on a 2,000-calorie diet. This amount of vitamin A and iron is high for a snack food. While carrots are traditionally regarded as rich in vitamin A, the same volume of carrots has less substantially less vitamin A than goji berries. Goji berries are a high-fiber food. Fiber is an indigestible carbohydrate in food. Following a high-fiber diet reduces the risk of colon cancer, constipation, Type 2 diabetes and other diseases. The Harvard School of Public Health recommends that people consume 14 grams of fiber for every 1,000 calories they eat. With 4 grams of fiber per 104 calories, the ratio of fiber to calories far exceeds the recommended amount. Most fruits and vegetables are low in protein. But one serving of dried goji berries has 4 grams of protein, or roughly 8 percent of the protein required by a 130-pound woman. Vegetarians might find snacking on goji berries to be a good way to increase their total protein consumption. Since muscles, enzymes, cell membranes and some hormones are made from protein, it is essential to sustain life. Columbia University New Service: Goji Berries: The New Miracle Fruit?